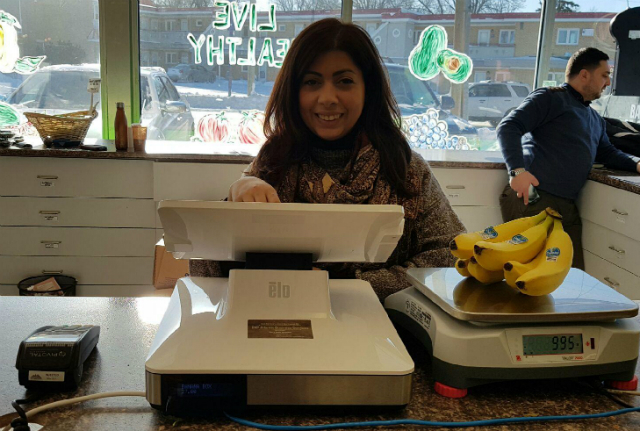 Specialty fruits and veggie shop Tomavo uses POS-n-go on the latest all-in-one tablets and Valor certified weigh scales to keep customers happy. Oh, it could also be the fresh healthy affordable produce. Owners Samar Najarian and Amer Khaled were tired of keeping track of sales on paper and needed a POS to streamline the business and keep the accounting records organized. “A good thing about POS-n-go, its very easy for our accountants, I think that’s highly important. Before it was all paper stuff stacked everywhere and trying to keep track of everything. POS-n-go is paperless, its easy and [reports] are sent by email, its much more organized,” said Samar. Tomavo uses Elo PayPoint all-in-one touch screen tablets, “Its very beautiful, very slick, we’ve had a lot of compliments from customers,” said Samar. Along with a fine array of vegetables, Tomavo carries a selection of unique fruits. One of the newest is the Hachiya Persimmon, a deep orange coloured fruit soft like a tomato that tastes candy sweet with a hint of baking spices. A great way to jazz up a winter day. Stop by the store, 1063 Mountain Road, Moncton, New Brunswick.